Commencement season is producing unparalleled excitement on campus as the spring Class of 2017 gets ready to walk across the College Park Center stage. The years of hard work and dedication will culminate in ceremonies full of rich academic tradition. Commencement ceremonies are Thursday-Saturday, May 11-13, at College Park Center. Watch live streaming of ceremonies. LEARN MORE. Due to road closures in downtown Arlington, traffic will be detoured for Commencement ceremonies. See the detour map. 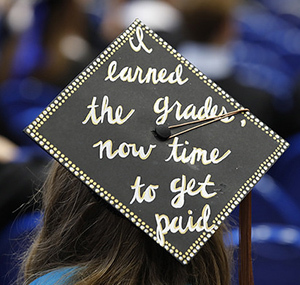 Send photos of your decorated graduation cap for a chance to win one of three prize packs sponsored by the UTA Bookstore. All photos must be submitted to socialmedia@uta.edu by 11:59 p.m. on Wednesday, May 10. 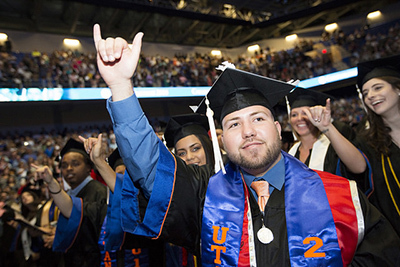 UTA community members will vote for their favorite cap on the UTA Facebook page Thursday-Saturday, May 11-13. Winners will be announced on Monday, May 15. See full contest details at bit.ly/MavGrad2017. 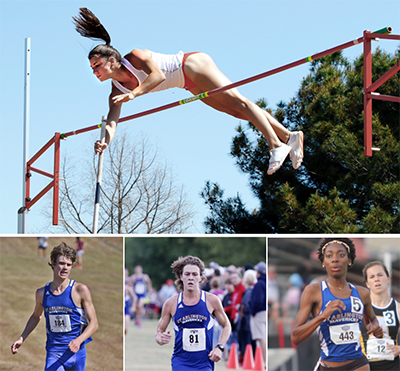 UTA's men's team hopes to claim its third title of the year when it competes in the Sun Belt Conference (SBC) Outdoor Track and Field Championship Friday-Sunday, May 12-14, at Maverick Stadium. Admission is free for everyone on Friday and all weekend for those with student ID from SBC schools and those age 5 and younger. Tickets are $10 for adults and $8 for ages 6-17 Saturday and Sunday at utatickets.com. A win will be the Maverick men's 10th outdoor title. The team won the SBC cross country and indoor track titles earlier this season. LEARN MORE. The Sun Belt's first-team All-Conference tandem of senior Astrid Gehre and freshman Anna Wichert was selected as the league's automatic qualifier to the 2017 NCAA Doubles Championship. The tournament is set for Wednesday-Monday, May 24-29, at the University of Georgia. LEARN MORE. Watch the Dallas Wings' season opener against the Minnesota Lynx at 7 p.m. Saturday, May 20, at College Park Center. Season and individual tickets are available at utatickets.com. Learn more at the Dallas Wings website and Facebook page. Hundreds of volunteers—actors and behind-the-scenes support staff—are needed for UTA's full-scale emergency response drill on Monday, July 31. The goal of the drill is to evaluate UTA’s response to an active shooter incident. Emergency responders from UTA and the City of Arlington’s police and fire departments will take part in the exercise at College Park Center. Lunch and a T-shirt will be provided to all participants. Register to volunteer. 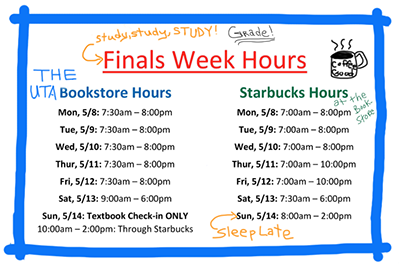 Through Friday, May 12—Final exams. Tuesday, May 16—Census date for summer intersession.